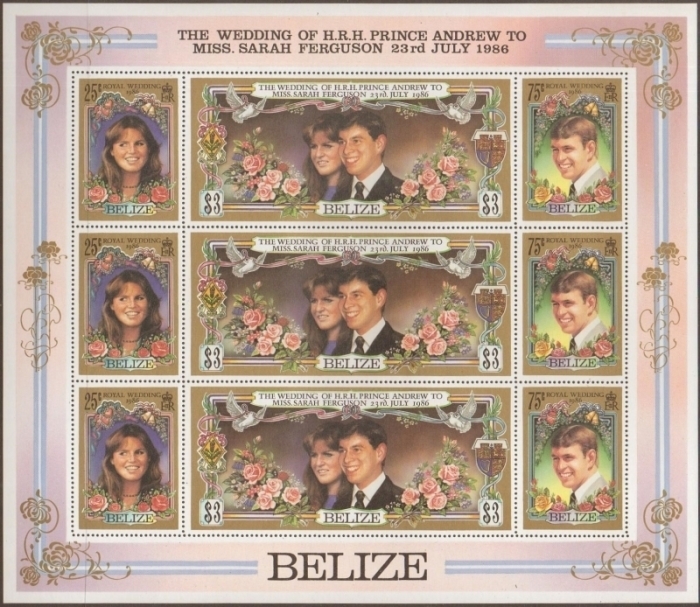 The following assessment on the creation, production and distribution of the 1986 Royal Wedding stamp issues for Belize and absolute proof that the inverted black inscriptions error stamp sheetlet was intentionally created and is NOT a rarity nor genuine error will be revealed on this page. Sorry to say but this devalues the "error" to the status of many other made for collector errors produced by the Format Printers. At present these varieties are being offered and sold for anywhere between $120.00 to $350.00 for a strip of three. The value should be $10.00 to $15.00 for a strip of three. They are simply an interesting novelty. 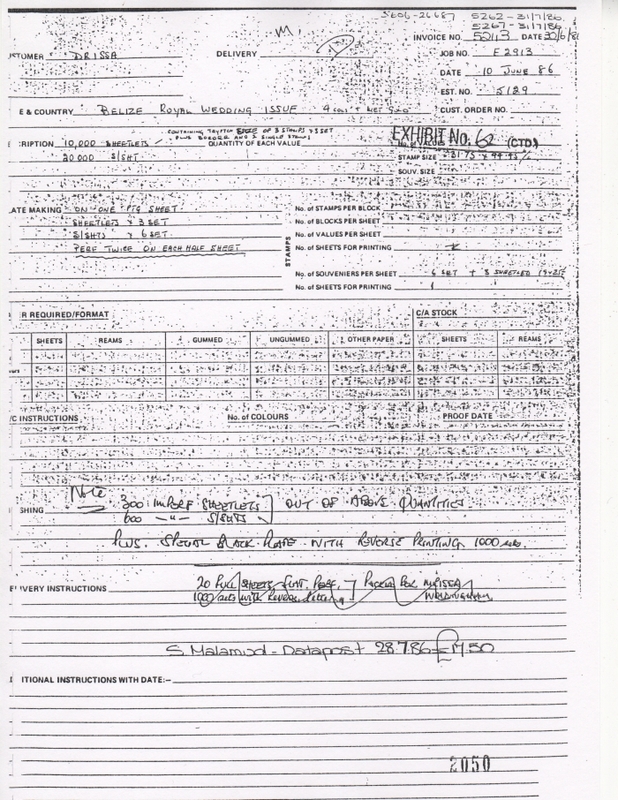 The assessment is taken from the documents obtained from the trial exhibits presented by the prosecuting attorney in the trials against the printers and associated companies in 1989. 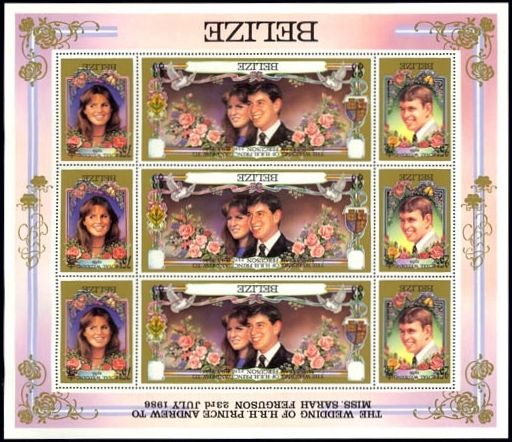 Even though the stamps in question were proven to not be made illegally, they still are intentionally made for collector errors and some stamp dealers and their companies deceitfully sold them to unaware collectors as genuine errors comparing them with stamps such as the U.S. inverted Jenny and such. 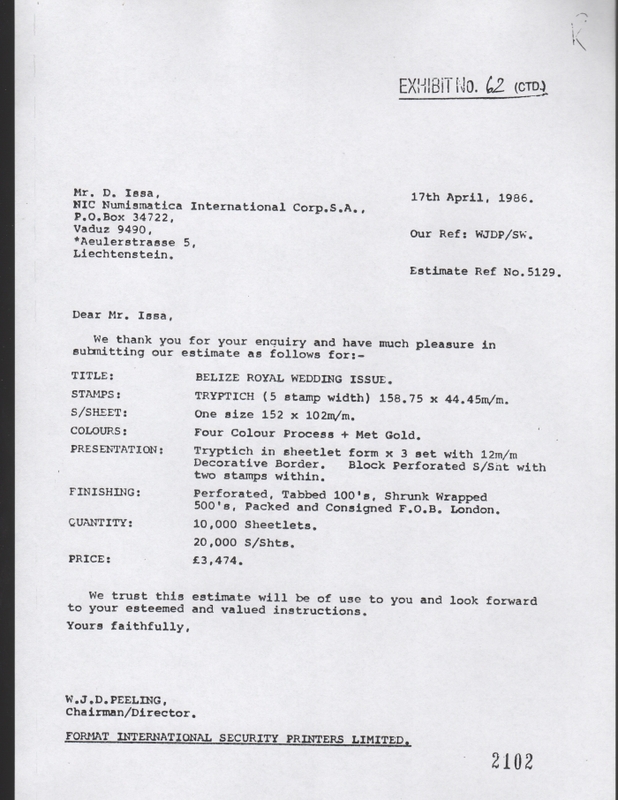 Around April 16, 1986 a Mr. D. Issa owner of Numismatica International Corp. S. A. 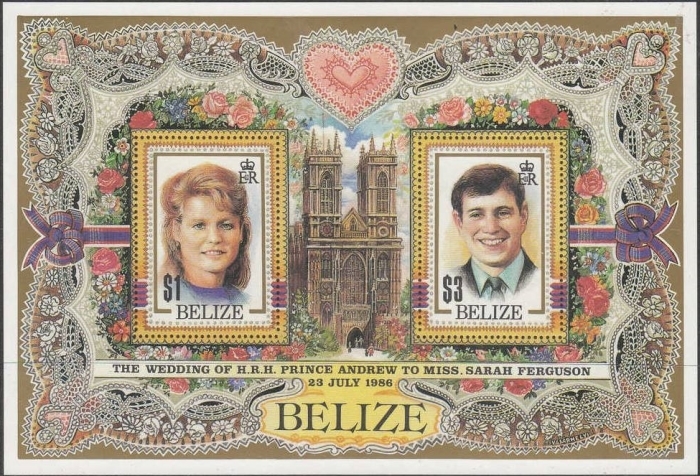 (NIC) located in Vaduz, Leichtenstein requested an estimate from the Format Printers for 10,000 sheetlets and 20,000 souvenir sheets for a newly designed stamp issue for Belize for the 1986 Royal Wedding of Prince Andrew and Miss Sarah Ferguson. 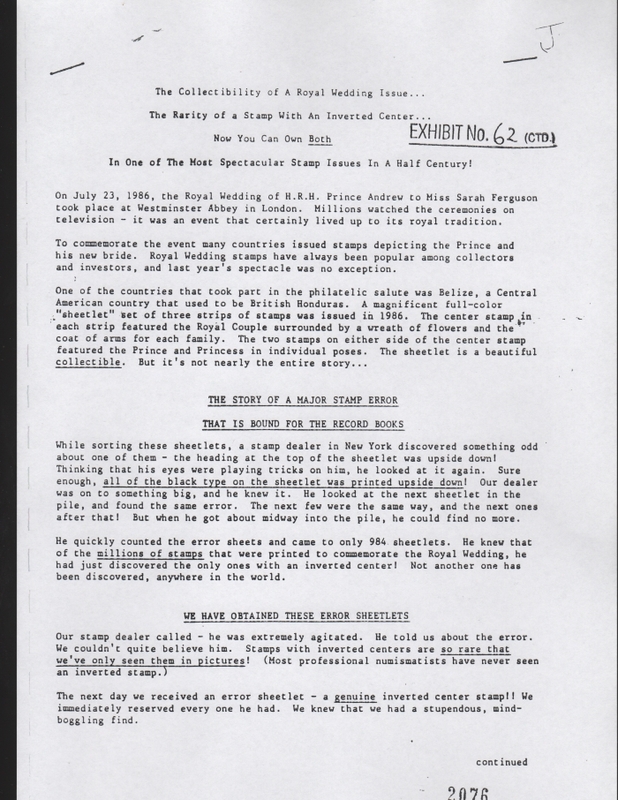 Although the ties to Belize with Mr. Issa are not clear I presume this was originally discussed and approved by the Belize Philatelic Bureau. The estimate to produce them was for the cost of £3,474. 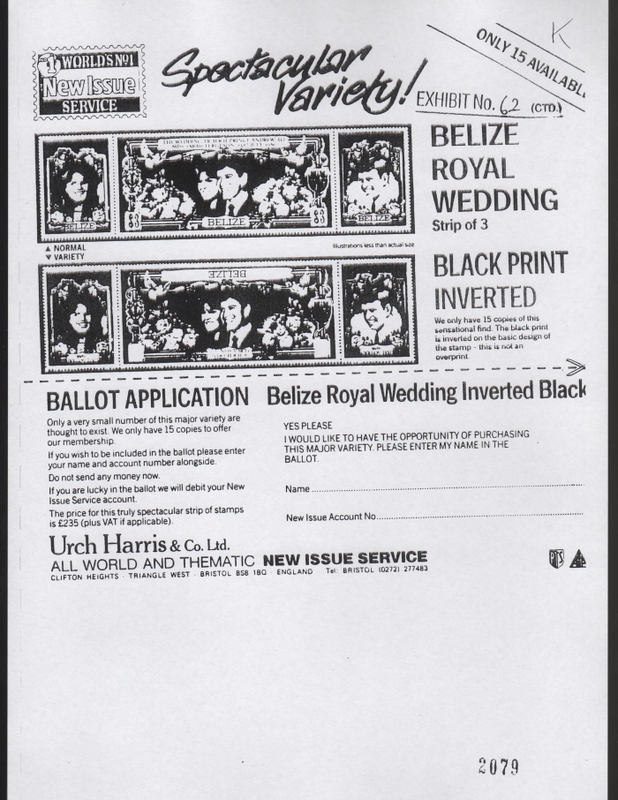 On June 10, 1986 an invoice for the production and completion of the 1986 Royal Wedding issues for Belize was made to Mr. Issa and this is the first piece of evidence proving the production of not only the made for collector inverted black inscriptions error but also the production of the imperforate varieties of the stamps and souvenir sheets. Noting that 1,000 sets of the black inverts were ordered. Actually because of the numbers of strips in the sheetlets it is 1,002. Also included is the order for 300 imperforate sheetlets (which I have seen none on the market) and 600 imperforate souvenir sheets all taken from the main quantities requested. 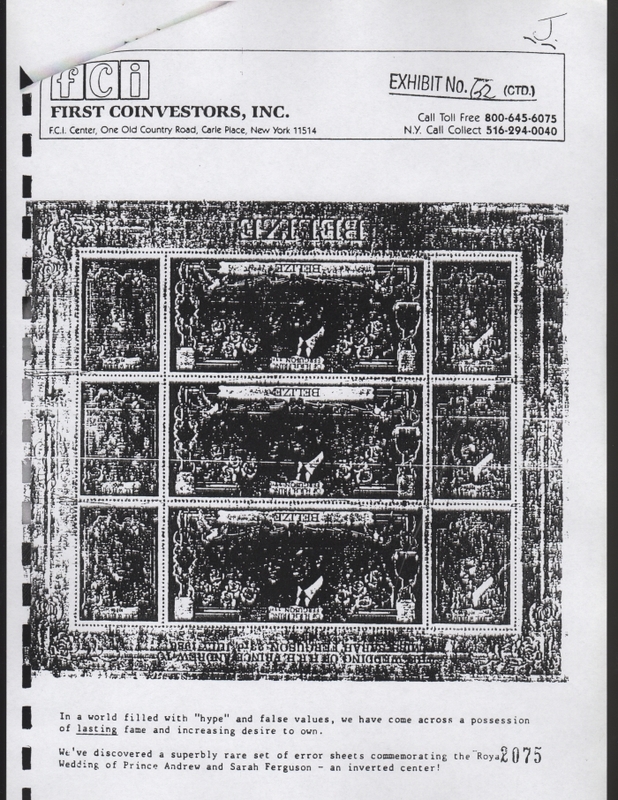 I can assure you that with the availability on the market from numerous sellers that all of them have been retained other than the sheetlets and souvenir sheets in imperforate form. The whereabouts of them is still a mystery. I note here that several other Belize issues of the time were included in the production but that is another story. According to the documents and this is kind of funny. 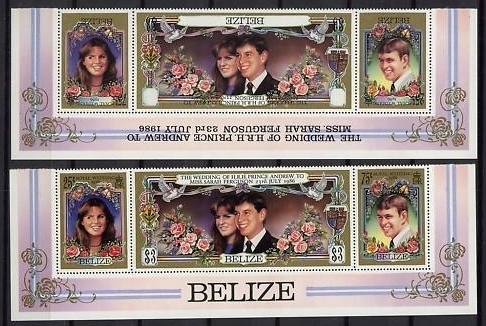 10 sheetlets were sent to the postmaster general of Belize (a Mr. Godfrey) and the invoice date was July 22, 1986! One day before the major catalogs stated date of issue being July 23, 1986. Wow! 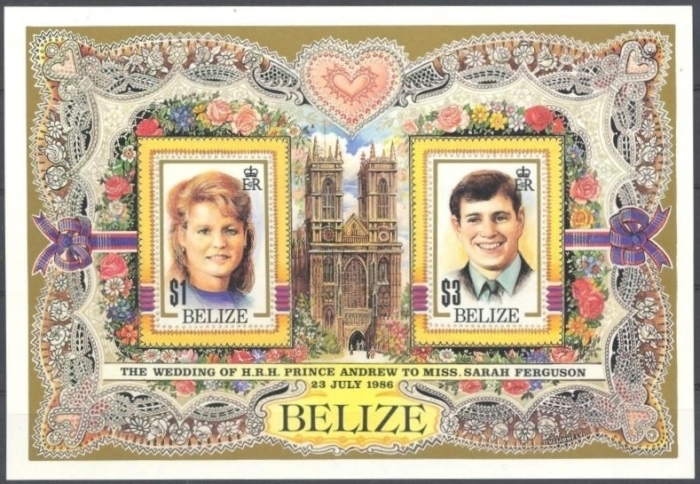 A whole 10 sheetlets were available in Belize on the date of issue! Not to frett though. 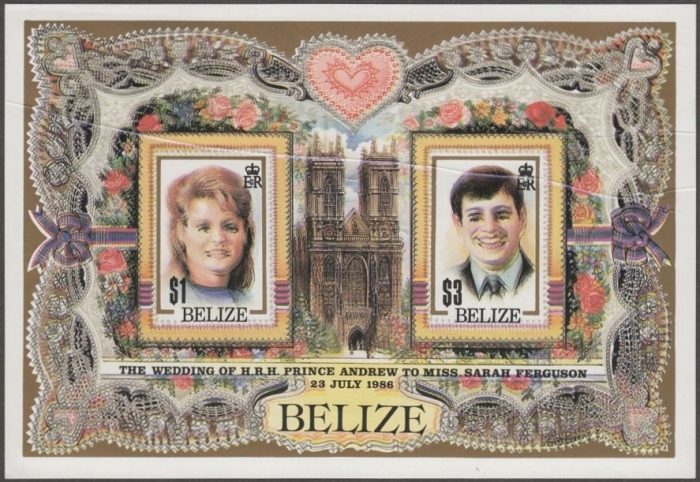 Another 1,000 sheetlets and 1,000 souvenir sheets were delivered to the postmaster general of Belize on July 28, 1986. Now the status gets real murky. Evidence shows there was a reprinting. The first company to get involved was, and this will probably not shock knowing collectors, Inter-governmental Philatelic Corporation (IGPC). Run by Mr. S. Malamud. And now if you noticed at the bottom of the imaged invoice that the stock including the inverted black inscriptions errors was delivered to his company. Interesting yes? What is more interesting is the lies and deceipt used to fool collectors. In comes Stanley Apfelbaum owner and operator of First Coinvestors, Inc.(FCI). Notorious for overgrading coins and doing bad things with them. A big advertisement announcing the discovery of the "error" by his stamp dealer "friend" in NY (Mr. Malamud I am sure) who just "happened" to come across the error while sorting through the sheetlets. And how many did he find? Why 984 sheetlets with the error! Yea right! Here is the advertisement in it's entire form. $895.00 for one sheetlet! Nice! Oh but what happened to the rest of them? 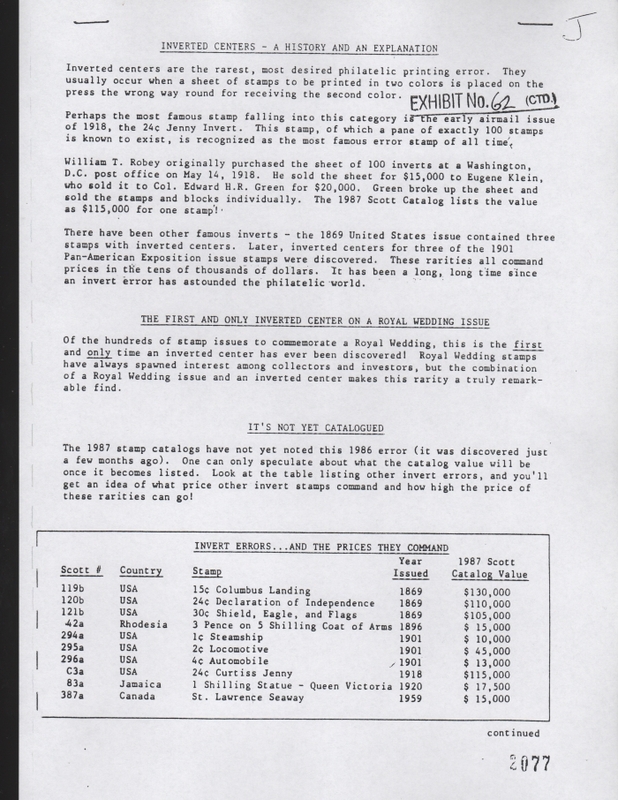 In March of 1987 a reprinting was done by the Format Printers. The shipments went to Urch Harris. What is not clear is what was reprinted. There are two separate invoices. My belief is that one is for the normal issues and one is for the "error" and possibly imperforate souvenir sheets. Again as I stated earlier the imperforate souvenir sheet is not readily available. Only one dealer appears to have them in present times. According to this dealer, he obtained around sixty of the imperforate souvenir sheets from Clive Feigenbaum (owner of Urch Harris). The location of the rest of the quantity is unknown to this day. Here are the two invoices. As you can see the existence of these varieties has a dark and shady past. And they should be treated as such I am afraid. They should be priced between $5-7.00 and no more. It is time for sellers and buyers to get this "error" in the right status. The trial documents also show that certain dealer run stamp agencies are not to be "trusted" by anyone including the stamp catalogs. 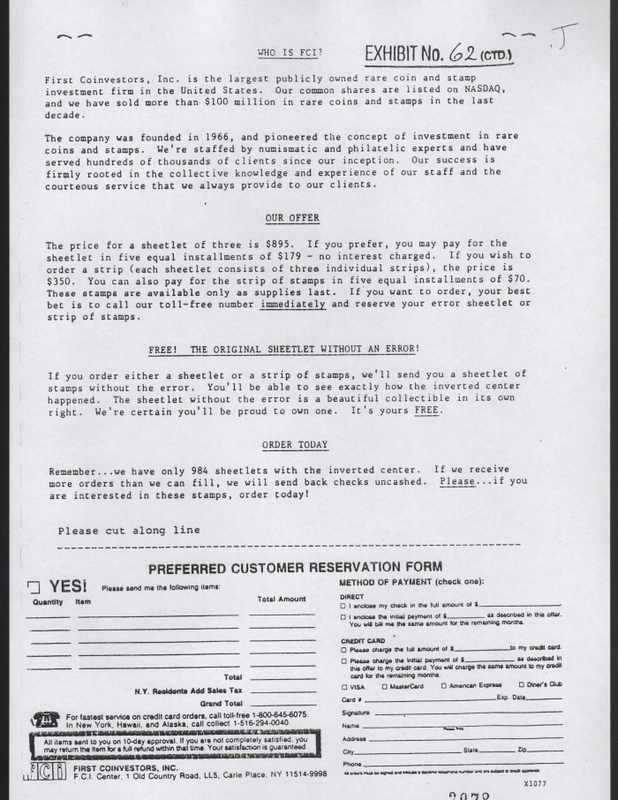 Catalog editors should not just take the word of the owner of the agency who will "say" the stamps are valid and follow the guidelines of what can be listed in the catalogs. 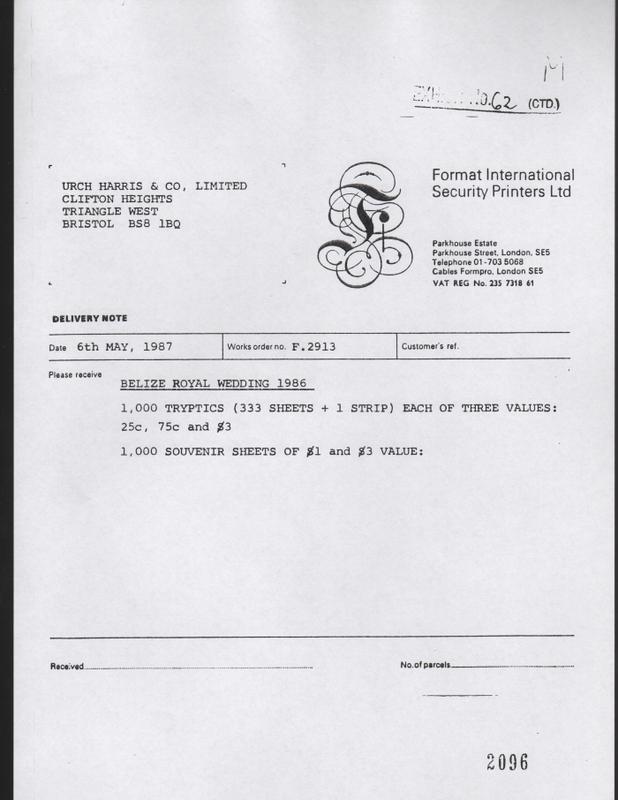 These documents show absolute proof that these owners are not to be trusted in any regards to the validity of stamp issues produced through their "private" stamp agencies. Now here is a true error of the souvenir sheet. 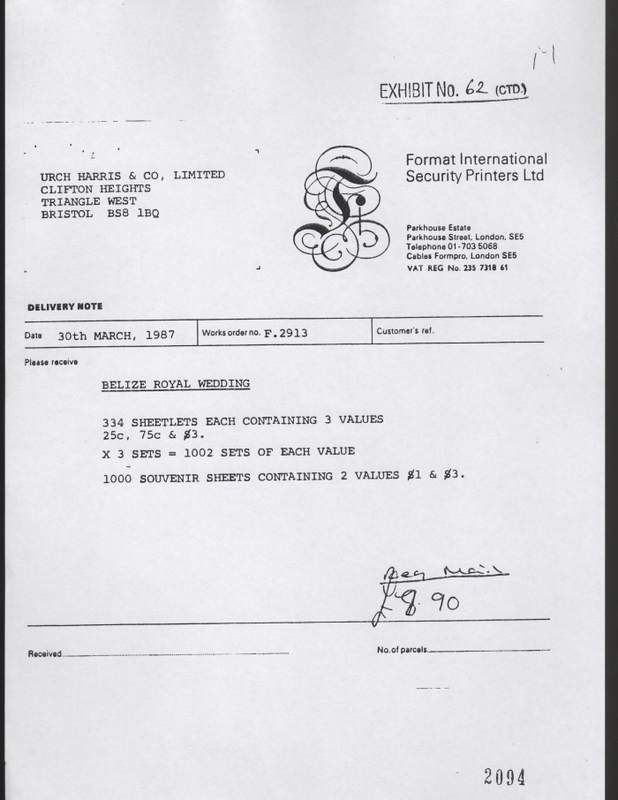 This basically sums up the evidence showing quantities and what was produced in regards to the Belize 1986 Royal Wedding Sheetlets and Souvenir Sheet. It proves the inverted black inscriptions error is really only a made for collector error and not genuine or in the class of the inverted Jenny and other such genuine inverts at all! It also shows the deceitful tactics used by IGPC and FCI in selling of the so called errors. Might I add that some of the same dealers are still "running the show" to this day. If you have any examples of the missing imperforate sheetlets or have any varieties of any of the above as in specimens, errors, or progressive color proofs, please feel free to contact me and send me images!